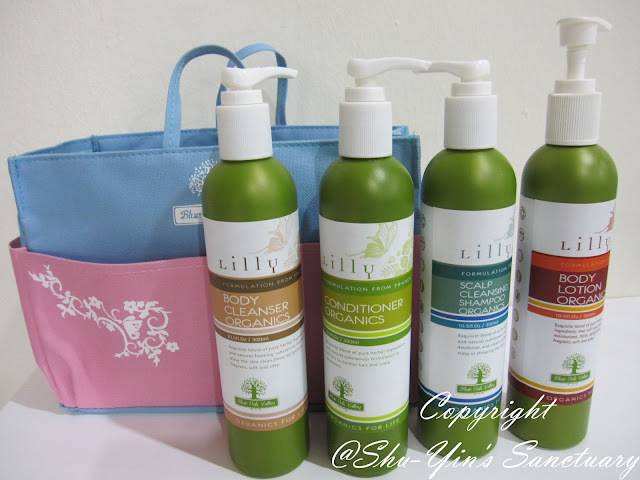 I am honoured when I was told that I'm the first person to review Blue Oak Valley's Lilly Personal Care Range. I'm also happy because it's a package for the mummy (me!) and not for my kids, which is rare! With this product range, it is also the first time I'm using organic body care products. So what is Blue Oak Valley (BOV)? Blue Oak Valley is a Malaysian company that specialises in organic, cruelty-free and natural products. Entirely plant-based, it is eco-friendly and aims to reduce the use of packing material, source-sustainable ingredients and recycle waste. BOV commitment is that they use the finest natural ingredients which have been sourced from proven and effective botanical extracts from all over the world. BOV only uses ingredients that are 100% natural and certified organic by authorized agencies. They build partnership with suppliers and farms that share their vision and commitment, and believe in the numerous benefits of organic personal care and home care products. BOV selects ingredients for their efficacy and real benefit rather than their aesthetic value. Their philosophy says that BOV only uses active ingredients from naturally and organically grown plants. They do not use any animal products, silicones, chemical sunscreens, paraben preservatives, phthalates and petrochemicals. BOV products are non-allergenic, SLS and SLES free, Alcohol-free, and also 100% biodegradable and environmentally friendly. Their slogan 'Organics For Life' says everything about them with their note to the customers "each time you use our products, you are helping to mantain a healthier and sustainable environment, home and lifestyle. One by one we can change the world and make it a better place." I was pleasantly surprised when I opened the package and saw this nice BOV organizer bag that comes with the Lilly range of products. Wah...something unexpected and kinda made my day! Everybody loves a good surprise! This organizer bag is really useful (I've never owned an organizer bag before! ), and now sits inside my Longchamp bag as it helps to organize my stuff. How handy is that. So these are the 4 bottles that I received for reviews. Scalp Cleansing Shampoo Organics, Conditioner Organics, Hand and Body Lotion Organics, and Body Cleanser Organics. The first thing I noticed when I used this was the smell. I didn't know herb-infused shampoo can smell this nice. I was pleasantly surprised! It smells so raw and herbal yet fragrantly mild. With my hair cropped shorter now (shoulder length), I only needed 1 pump and it is enough for my hair. Maybe because the fact that I've got little hair too. But it sure is lasting. I'm also surprised that it lathers quite well for an organic shampoo. Usually my kids' organics shampoo don't lather much. I haven't used organics shampoo on myself before and I must say that my hair is loving it. I used to have oily scalp, and before end of the day, my hair especially my fringe is very oily and I hated it. But now I feel my hair is less oily at the end of the day. This pure formula is made with raw and active plant ingredients that strengthen, protect and moisturize hair to leave it soft and full of body. I am also someone who washes my hair daily, and now with organics shampoo, I feel more safe to be washing it all the time without harmful chemicals stripping my hair off their natural state. And I feel really fresh after a hair wash. Totally loving it! It has the same nice raw, herbal-infused smell as the shampoo, so my nose is liking it. But unlike the shampoo, I need a few more pumps to cover my hair ends. The conditioner is rather runny. So although it says that it is a concentrated conditioner, the runny liquidity makes me feel that it is not concentrated enough, so I tend to use a little bit more than what the instruction says. It takes about 2-3 pumps before I felt my hair ends goes all shiny and coated with the hair conditioner. I'm not sure if it is just me, but I always tend to finish my hair conditioner way much faster than my shampoo. Not just this brand, but same applies for me for other brands too. Ratio is about 1:1/2. I finish my hair conditioner and I still have about 1/2 bottle of shampoo left every time. So maybe it is just a me kinda problem. Anyway, just to let you people know. But after using it, it tames my dry ends and gives my hair a healthy shine with this strengthening conditioner. It also moisturizes and detangle my hair making me very easy to comb after I pat-dry it. I am someone who cannot live without hair conditioner, or my hair just won't comb. And this one does a good job. The ingredient which list the jojoba and macademia nut oils nurture and smooth, while wheat and milk proteins helo protect and restore elasticity. Burdock and nettle renew and invigorate hair follicle and scalp, which is why my hair feels good after using it. This is my favourite in this range. This body cleanser is an exclusive blend of pure natural, herbal and organic ingredients and natural foaming substances, with the same pleasant raw, herbal-infused smell as the other products of this range. Using this body cleanser, with its smell and all, it makes me think back of the time when I was in Tanjung Rhu Resort, as the hotel also uses such herb-infused smell body shampoo. It gives me a luxurious feeling and I feel great after every use. It also leaves a lingering smell after shower. Nothing too strong, just a mild fragrant of the pleasant herbal-infused smell that I love. It somewhat has the spa-like smell and feeling whenever I use this body cleanser. You know when you go for spas, they tend to use those herb-infused body oils when giving you massages. And after that they also use herb-infused body wash when you go for a bath/shower. Yes, that is the kind of smell and feeling I've got when I use this body cleanser. So that is why this is my favourite product. It gives me a luxurious feel to it! I tend to use this more often, especially when I bathe at least twice a day. I only wash my hair once every day, but I never fail to use this body cleanser every time I bathe so that I emerge clean and nice-smelling after my shower. And since this is organic, I use it with peace knowing that it does not contain harmful substances. Love it! This is another non-greasy lotion that I give a thumbs up to. It is also rather runny, but unlike the hair conditioner, I love this runny milky lotion as it absorbs easily into my skin, especially on my dehydrated legs. My legs must be really 'thirsty' as it just absorbs it super fast like nobody's business. So I lather it on my legs very generously every night, hoping that this would gradually make my legs less dry. It seems to work really well, and I feel the skin on my legs are not so 'tight' anymore. I also apply this lotion on my body, which I seldom do, but I know I should. So every few days, I would apply this lotion on my whole body after my shower. It is ruch in pure herbal extracts, it moisturizes and nourishes the skin. Love the smell just like the rest, with the chamomile, aloe extract and ylang-ylang give it a mild exotic floral scent that lingers for quite a while. Yes, 1 winner will win this whole set of Lilly range! All you need to do is just Like Shu-Yin's Sactuary's Facebook Page, and also Like Blue Oak Valley's Facebook Page and leave a comment in this blog post. It is this easy. Please leave an email address for me to contact you. Giveaway ends on 30th June 2013 11.59pm Malaysian time. The winner will be chosen randomly on 1 July 2013 and will be posted in this post and will be contacted via email. If no reply from the winner within 48 hours, then I will announce for a new winner. 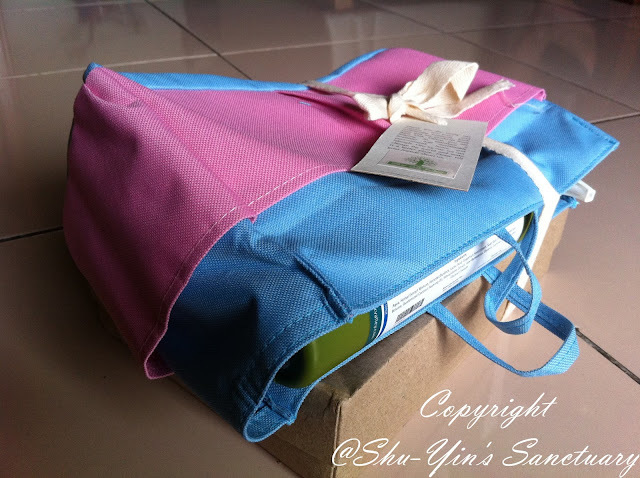 - and after that will be 15% off for 12 months (until 16 June 2014)using discount code SHUYIN2013. Thank you to all who participated in this giveaway. 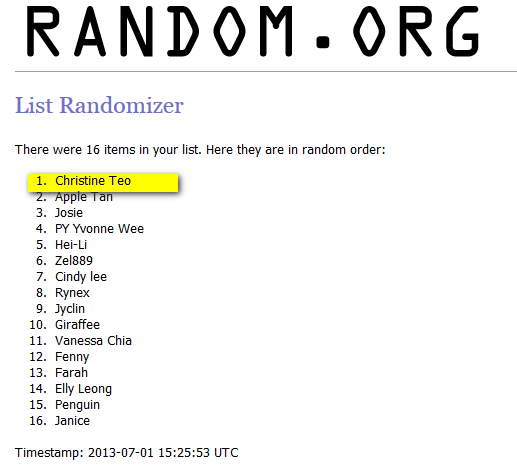 The winner of the Blue Oak Valley's Lilly Range Set is Christine Teo! * Disclosure: I received the Scalp Cleansing Shampoo Organics (300ml), Conditioner Organics (300ml), Hand and Body Lotion Organics (300ml), and Body Cleanser Organics (300ml) for review purpose, but no monetary incentive was received. All text and opinions are of my own and represents my honest opinion of the product(s). After reading your post on BOV products, i would like yo try it as well. Thanks for the chance given. Lets go green. 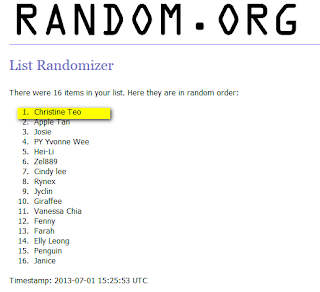 Hi..I'm Vanessa Chia...Hopefully can wint this! My email address : vanessa_824@yahoo.com...Thanks for organising this! I love organic body/hair products.. Would love to try this. I would love to feel, touch, smell and use this items immediately! Hi My Name is Farah. I hope I can win this!! Yay! Thanks for the chance to win! Great review! Great review. I've liked both pages. Thank you for hosting this giveaway and introducing me to Blue Oak Valley products. I would be grateful if given the chance to try out the products. Wow ! What a surprise to win the giveaway ! I have sent you my details already ! Hi Shu Yin, already a liker of your page. Liked BOV page. Am glad to participate in the giveaway too. Really interested in the scalp shampoo especially for me.